Here are the player ratings based on performances from the second T20I between India and West Indies in Lucknow, which the home team won by 71 runs to clinch the series. Another one-sided affair in the ongoing T20I series between India and West Indies as the former took an unassailable 2-0 lead in the second game at the Atal Bihari Vajpayee International Cricket stadium in Lucknow. With the West Indies that pushed India in the first three ODIs going missing, the hosts had a bed of roses to walk upon at Lucknow after being put in to bat. A century stand from Rohit Sharma and Shikhar Dhawan and a final flourish from the former, who recorded his fourth T20I ton, led India to a sizeable 195/2 on a two-paced wicket. The visitors were never in the game chasing the target and kept losing wickets consistently, ending up at an abject 124/9. The Indian skipper was in exceptional touch at Lucknow as he played himself in and stepped into 'Hitman' mode in the final few overs. Rohit was subdued initially and took his time to construct the innings. His half-century came off 38 balls as he and Dhawan put on a telling opening stand to let India dictate matters after being put in to bat. 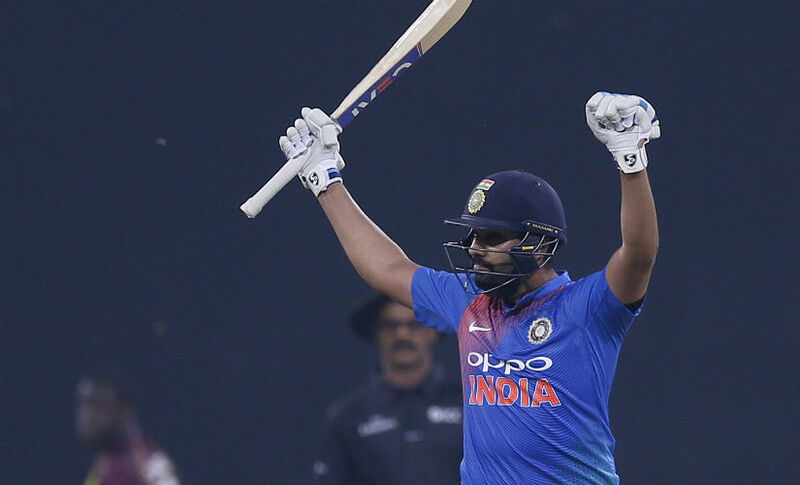 Rohit led the charge in the final few overs, smacking as many as seven sixes in a big ground, as he remained unbeaten on 111 off 67 balls — his fourth T20I ton. In the process, Rohit also eclipsed Virat Kohli as India’s highest ever T20I run-scorer and is second in line behind Martin Guptill in the all-time list. Bumrah was at his exceptional best coming in behind Khaleel Ahmed and Bhuvneshwar Kumar with the ball. He cramped the West Indies batsmen for room, gave nothing away and sent down another terrific spell to pave way for wickets from the other end. 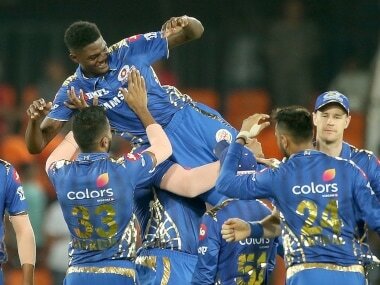 In a notably well-planned execution, he had his Mumbai Indians teammate, Kieron Pollard, caught off his own bowling with a short pitch delivery. Bumrah added one more wicket in the death to walk off with commendable figures of 2/20. Bhuvneshwar varied his pace and length early on to put the West Indian batsmen in two minds. From the knuckle ball to back-of- a-length deliveries, Bhuvneshwar kept the batsmen guessing early on. His first two overs cost just 8 and he returned in the death to add two wickets and leak just four more runs to end a perfect day. He has been criticised for losing his length in the final few overs of late, but at Lucknow, Bhuvneshwar was every bit the Indian seamer that Sunrisers Hyderabad fans love. The southpaw finally found some form after a poor run in the series as he combined with Rohit in a 123-run opening partnership that set the platform for India. Dhawan was free flowing on a two-paced wicket and even managed to evade a good couple of overs from his nemesis this series, Oshane Thomas. In a bid to increase the run-rate though, Dhawan perished as he swept Fabian Allen to square leg. His 41-ball 43 paved the way for Rohit to play himself in and go big. Khaleel’s graph this series has gone skyward and in another cracking show, the left-armer picked up the first two wickets of the visitors' innings, and was right on the money on a queer wicket. He cleaned up Shai Hope with one that stayed a touch low and then proceeded to flummox Shimron Hetmyer with a slower delivery. Khaleel bowled his first three overs upfront and is proving to be a massive find for India in the limited-overs format. In another economical spell of bowling, Krunal showed just why he could be a major asset to the Indian T20I side. Replicating Ravindra Jadeja’s limited-overs template, Krunal bowled stump-to-stump lines and restricted the scoring areas for the Windies batsmen. While he failed to pick up a wicket, Krunal’s impressive spell from one end allowed Kuldeep Yadav to flourish. In another excellent display of spin bowling, the 'Man of the Match' from Kolkata, Kuldeep, destroyed West Indies’ mini-resuscitation by removing Darren Bravo and Nicholas Pooran in the same over. The chinaman continues to run amok with his wrong ‘uns and the Windies batsmen had a tough time trying to read him off the surface. Although he was smoked for three sixes in the final over, Kuldeep’s two-wicket burst tilted the game entirely India’s way. Rahul walked in during the final few overs and helped Rohit push India’s total close to 200. His big-hitting helped India add 62 in the final 28 balls alongside the skipper, pitching in with 26 off 14 in the process and importantly putting his partner on strike more often than not. The second banana role might not help Rahul earn a permanent spot but goes a long way in showing his adaptability to game situations. The impressive Windies seamer began with a brilliant couple of overs, of which the first was a maiden. He had the Indian openers at sea with his extra zip and pace. Giving him a third consecutive over was perhaps an ill-planned move by skipper Brathwaite as Rohit and Dhawan had gotten used to the pace by then and Thomas wasn’t changing things up. The over leaked 17 and spoilt his figures, although Thomas bowled a good final over to keep his figures to a respectable 0/27, considered excellent by T20 standards. The promise Paul showed in the Under-19 World Cup in 2016 had gone missing this series, but a bit of it was on glimpse at Lucknow as he varied his pace and used the sluggishness in the surface to restrict the scoring rates. After a seven-run opening over, Paul came back impressively in the middle-overs to mix his pace and keep Rohit and Dhawan silent. He finished with a brilliant penultimate over to end a great day with the ball. He came out to bat with the game all but over but showcased his striking prowess by trouncing Kuldeep for back to back sixes. Allen learnt from Khary Pierre’s early mistakes and gave the ball more air to deny the Indian batsmen any extra pace. He used the odd quicker ball to contain the fleet-footed Indian openers and came off with pretty good figures. He opened the account for Windies with the wicket of Dhawan and finished his four-over spell with an economy of just over 8. He was run-out after facing a delivery, going after a non-existent run to fall well short. Bravo was left to anchor the innings after Hope and Hetmyer deserted the visitors, and promised to do so as he mixed caution with aggression in an enterprising stay at the wicket. He managed to play himself in against some top quality bowling by the Indian seamers and even cracked a few delightful shots before Kuldeep sent him packing, courtesy a fine catch by Rohit. Bravo’s Caribbean Premier League (CPL) stint had shown he has all five gears and his innings at Lucknow proved that he could replicate the success at international level if given the right kind of backing. With Windies losing Hope early, Hetmyer, alongside Bravo, batted sensibly scoring the odd boundary and playing out the good balls. Just when it seemed like Hetmyer was playing the game situation to perfection, he slogged a slower ball from Khaleel straight to long-on. Like his dismissal at Eden, Hetmyer’s rush of blood was uncalled for and led to his downfall. It could be one major takeaway for the youngster from the tour. The left-arm spinner had a rather impressive outing in Kolkata but on a wicket where pace off the ball was the way to go, Pierre came off looking ugly. He was brought on in the powerplay overs but failed to restrict Dhawan and Rohit as he gave away 21 in his first two overs. Though he picked up a reckless Rishabh Pant, a 21-run final over completely spoilt his evening. The West Indian skipper was lacklustre with the ball and failed to adapt to the requirements of the surface. He landed the ball short, gave the batsmen more than enough width and leaked runs aplenty in the process. Brathwaite’s final two overs in the death cost 32 and sent Paul and Allen’s decent work down the drain. 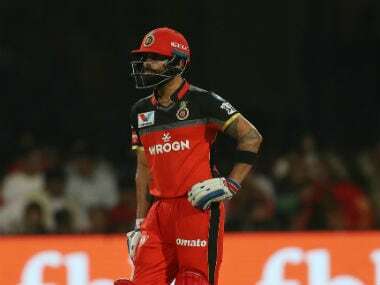 He looked to salvage pride with the bat and stayed around till the end, but failed to rally together enough support to lend some respectability to the total. After a dreadful opening stint in the first T20I, Ramdin was pushed down the order but still came ahead of his usual role in the lower middle-order. The West Indian watched as wickets kept tumbling at the other end but could do little to keep the scoreboard ticking. He fell for 10 off 17 balls, flicking an innocuous delivery from Bhuvneshwar to square-leg. The swashbuckling wicket-keeper batsman was promoted up the order as India went in search of quick runs after a strong opening partnership. With Rohit going bonkers at one end, Pant could have timed his attack wiser. Instead, he slog-swept Pierre without really getting to the pitch of the ball and gifted a catch to deep mid-wicket. Having just hit a boundary the previous ball, Pant perhaps got carried away and in the process let go of a wonderful opportunity to impress the think-tank. Given his ODI strike rate, Hope’s place in the T20I line-up should ideally be questioned. At the top of the order, he remains a bigger liability, one which does not do justice to the calypso flair of the Windies in this format. At Lucknow, he got off the mark with a glorious straight six but played out six dot balls before one that stayed low from Khaleel in the second over cleaned him up. A regular opener, Windies surprisingly chose to use the exciting left-hander in the middle overs. Pooran had an adventurous stay in the middle as he failed to read Kuldeep off his hand. The southpaw was beaten all ends up by Kuldeep off the first ball he faced but managed to come back strong with a well-timed reverse sweep for four off his second. Kuldeep, though, had him bamboozled with a googly off the very next ball. After an unconvincing innings at the Eden Gardens, Pollard once again struggled to get going as the Windies looked for stability along with quick runs. He was circumspect against Kuldeep and was smart enough to not go after him. However, after a couple more dot balls against Bumrah in the next over, Pollard skied a well-directed short ball back to the bowler. His deliberate attempt to foil Bumrah’s concentration while getting underneath the skier further degrades his rating. Rohit has used his Mumbai Indians teammates particularly well against Pollard this series with Krunal and Bumrah dismissing him in the two games. *Manish Pandey, Dinesh Karthik weren’t rated owing to their minimal role in the match.